This indicator is designed for binary options. Based on proprietary divergence of the CCI indicator. A down arrow appears on the chart. An up arrow appears on the chart. 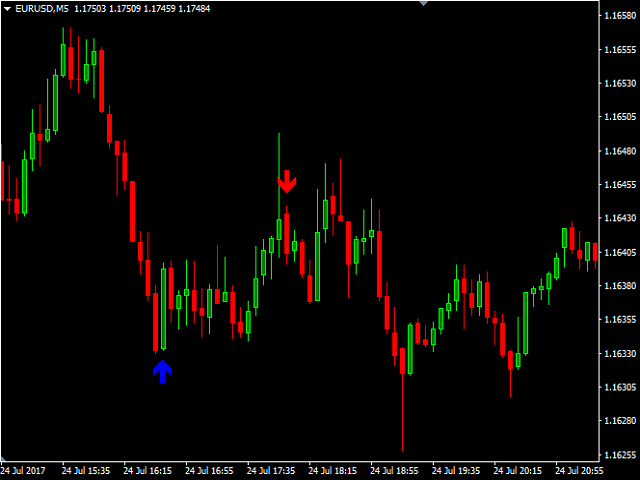 Expiration: Depends on the timeframe, signal is generated before the end of the candle, where the signal was generated. Example: timeframe - М5, example 5 minutes. The indicator is non-redrawable and non-lagging. Indicator is very good. Not sure what is 'proprietary' part of this divergence indicator, but just like divergence it is a hit or miss. So my rating is only based on the quality of signals produced by this indicator as we need to filter the validity of signal using some other method. * Added notification to mobile device.